A Junk-Foodaholic's Journey to a Healthy Lifestyle: How Much Sugar Is Lurking In Your Food? How Much Sugar Is Lurking In Your Food? Women's Health has a fun little quiz on their website. I like taking quizzes because it's fun to see if you're as smart as you think you are! Turns out I'm not (big surprise)! I got 6 out of the 10 questions correct which means (according to Women's Health) that I need a little brushing up on my sugar knowledge. Want to see how well you do? If you want to take the quiz without seeing the answers, read no further and take the quiz here. Otherwise, read on! I'm sure it comes as no surprise to hear that sugar is lurking in a lot of the foods we eat and drink. See if you can spot which product has less of the white stuff--sometimes it's just the lesser of two evils! Which cereal has less sugar: Frosted Cheerios or Frosted Flakes? Frosted Flakes: 11 grams of sugar in 3/4 cup. Frosted Cheerios: 12 grams of sugar in 3/4 cup. 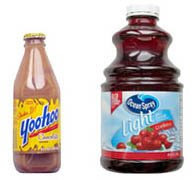 Which beverage has less sugar: Yoo-hoo or Ocean Spray Cranberry Light Juice? It's Yoo-hoo! Too bad the sugar in the fruit juice isn't screaming 'Yoo-hoo!' Also, don't be fooled by the word light either. Yoo-hoo: 28 grams of sugar in an 11-oz bottle. Ocean Spray Cranberry Light Juice: 33 grams of sugar in 8 oz. serving. Which snack has less sugar: Wheat Thins or Cool Ranch Doritos? Surely the Wheat Thins right? I mean, they're healthy for pete's sake! Well, that was my guess anyway. But I was wrong. Doritos beats Wheat Thins by a long shot! Did you know that sugar is sometimes added to prolong shelf life? I sure didn't. Wheat Thins: 4 grams of sugar in 9 crackers. Doritos: Less than 1 gram of sugar in 11 chips. Which cereal has less sugar: Cheerios or Raisin Bran? This one I got correct because I knew raisins have a lot of natural sugar in them. Non-sugar coated Cheerios are low in sugar, fat and heart-healthy. Pour them in your bowl and avoid a potential sugar rush before getting to the office. Cheerios: 0 grams of sugar in 1 cup. Raisin Bran: 19 grams of sugar in 1 cup. 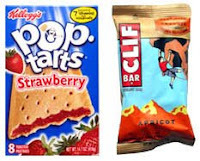 Which has less sugar: Pop Tarts or a Clif bar? I chose the healthy Clif Bar. Survey says? EEEEHHHH! Shockingly, Pop-Tarts takes the 'less sugar' prize. Pop-Tarts: 16 grams of sugar in 1 pastry. Clif Bar: 21 grams of sugar in 1 bar. Which has less sugar: Fruit by the Foot or Frozen Strawberries with sugar added? If you picked Fruit by the Foot, you are correct! Whenever you buy frozen or dried berries make sure to look for an ingredient list that contains one ingredient... strawberries! Strawberry Fruit by the Foot: 10 grams of sugar in 1 roll. Frozen strawberries: 70 grams of sugar in 1 cup. Which has less sugar: Campbell's Tomato Soup or Campbell's Cream of Potato Soup? I nailed this one. The answer is Campbell's Cream of Potato Soup. Tomatoes are rich with antioxidants but they also contain sugar. Plus, sugar is often added to enhance its naturally sweet flavor. Microwavable Tomato Soup: 18 grams of sugar in 1 cup. Condensed Cream of Potato Soup: 2 grams of sugar in 1 cup. Which has less sugar: Duncan Hines Chocolate Fudge Brownies or Smart Ones Brownie a la Mode? Are you like me and thought choosing 'Smart Ones' meant it surely has less sugar? Wrong! Sometimes when fat's removed, sugar's added to give flavor. Duncan Hines Chocolate Fudge Brownies: 16 grams of sugar in 1 desert. Smart Ones Brownie a la Mode: 21 grams of sugar in 1 desert. Which has less sugar: Good Humor Ice Cream Bar or Sun-Maid Raisins? The correct answer is the Good Humor Bar. Though the ice cream bar has less sugar, raisins are still the better choice because they have nutrients that help kill the bacteria that cause cavities and gum disease. Good Humor Bar: 12 grams of sugar in 1 bar. Raisins: 29 grams of sugar in 1/4 cup. 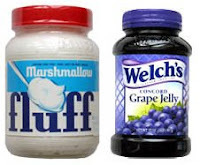 Which has less sugar: Marshmallow Fluff or Welch's Grape Jelly? Can you believe it's Marshmallow Fluff? But I wouldn't want to have a PB and Fluff sandwich, would you? For a better alternative, try real fruit spread that has no added sugar. Marshmallow Fluff: 6 grams of sugar in 2 tbsp. Grape Jelly: 13 grams of sugar in 2 tbsp. Labels: How Much Sugar Is Lurking In Your Food? As I have a sugar intolerance I am very aware of how much sugar there is in foods, however, when I first looked into it I was shocked that some 'savoury' foods contain more than sweet foods. Rachel - I was shocked too! You just don't expect to find sugar in savory foods. It's scary really. I think all that hidden sugar is partly to blame for kids being hyper and lethargic and all of that. You just don't realize it. A friend of the family just found out she is diabetic, so she is paying attention now and she was saying how shocking it is, even at Whole Foods.